KOSHH believes that June will see the announcement of the long feared plans to demolish Epsom, St Helier and Queen Mary's Hospitals. The plan was first leaked during the "Traingate" incident. 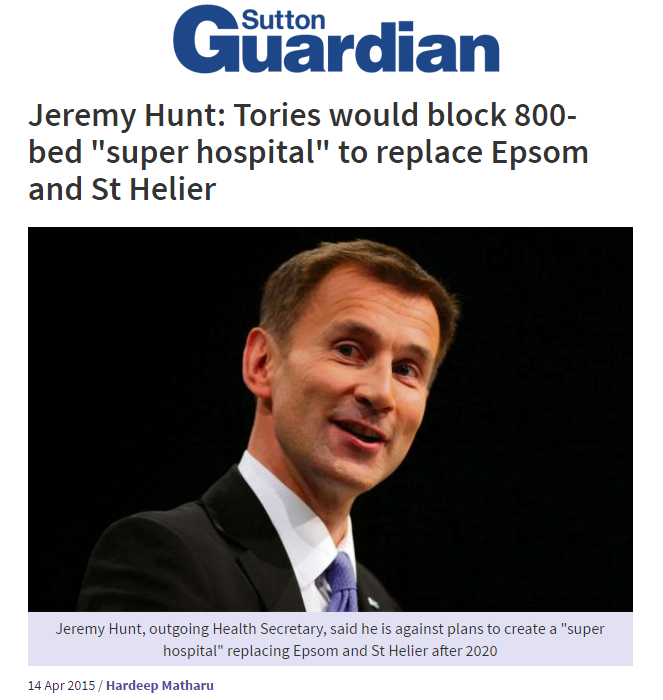 In the plan, the "preferred option" was to demolish Epsom, St Helier and Queen Mary's hospital for children, and it would appear that this is precisely what the Trust are due to announce in June 2016. 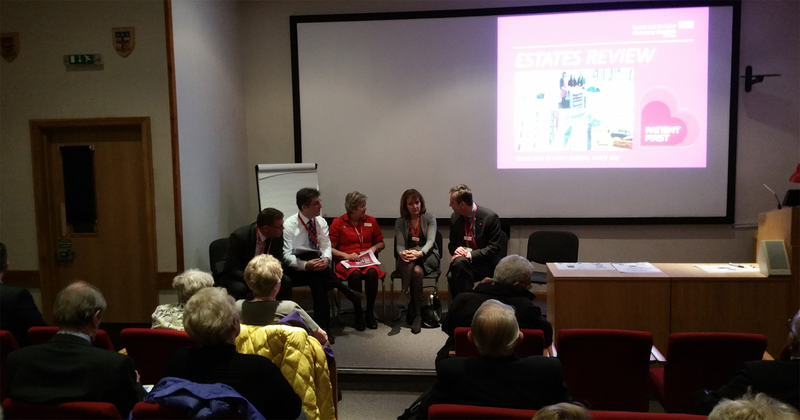 On the 19th of March 2016, the Epsom & St Helier University Hospitals NHS Trust held an "Estates engagement event" entitled "Buildings for our future", at which the Trust Chief Executive, Daniel Elkeles and a number of senior staff gave a presentation. The event, was apparently crafted to persuade the audience that the buildings within the Trust are no longer fit for purpose. They offered very little in the way of "evidence" for this, just their assertion that this is the case, and some photographs of peeling paint, old windows, and a temporary tarpaulin. In a seemingly contradictory fashion, Mr Elkeles told the audience that the Trust had performed very well, putting them in the top quartile of "Safe Hospitals" in England. Moments later however, he said that the buildings within the trust were "not fit for purpose" and were unsafe, and that this put the trust in the top ten worst buildings in the NHS. Daniel Elkeles announced that on the back of the "estates review", he has obtained permission from NHS Improvement, to prepare a "Strategic Outline Case" for the Trust's future plans. 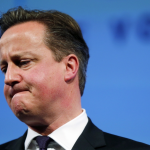 There were some vague references to the cost of building new premises for a figure of £500 million. KOSHH campaigners questioned whether this was enough money to replace three hospitals. 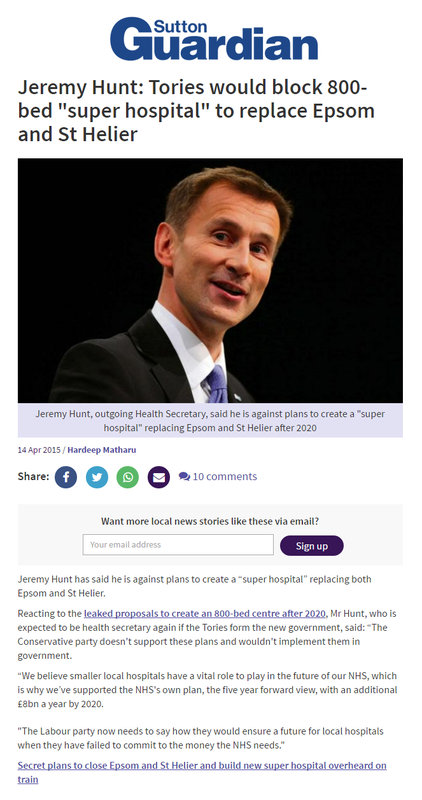 It is important to point out that Health Secretary, Jeremy Hunt has already said (14th of April 2015, article here) that he would block the building of a new hospital in South West London. The presentation included some discussion of what "sort of building" they would like to have, and that they would like to have 50% "Private Rooms", with en-suite bathrooms. 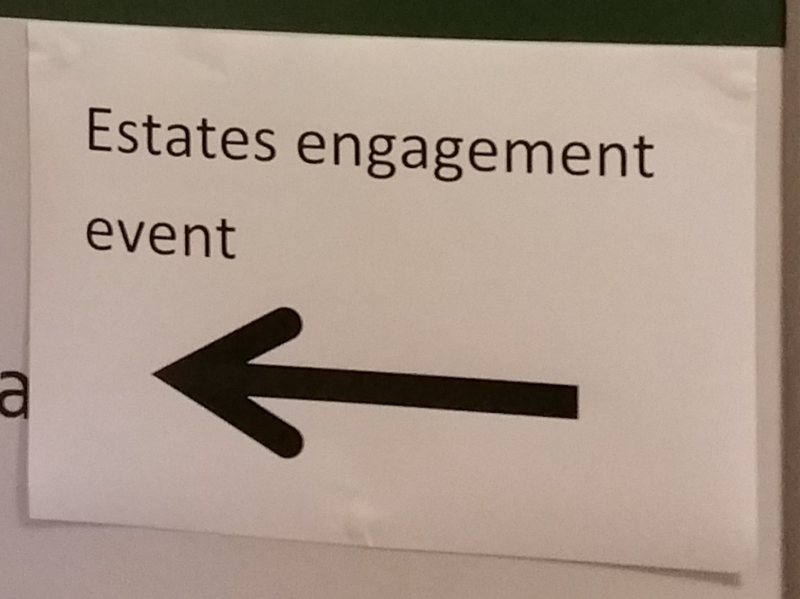 When the question of private rooms in an NHS hospital was raised by members of the audience, this seemed to cause great embarrassment to Mr Elkeles and his colleagues hosting the event. They promptly beat a hasty retreat and apologised for having used the word "Private", and said that they had meant to say "Single rooms". It was pointed out by people in the audience that it was a surprising coincidence that this percentage was so close to the amount of "revenue" which NHS hospitals are now allowed to raise from private patients (49% is permitted under the Health and Social Care Act 2012). No, this isn't a new craze to rival the Lambeth walk, it is instead a name dreamt up to describe walking around looking at printed versions of some of the slides used in the presentation. Once the initial presentation was over, we were treated to this "Gallery Walk" and we were asked to affix post-it notes to them with our thoughts. Several members of the presentation team were present to answer questions about the slides. 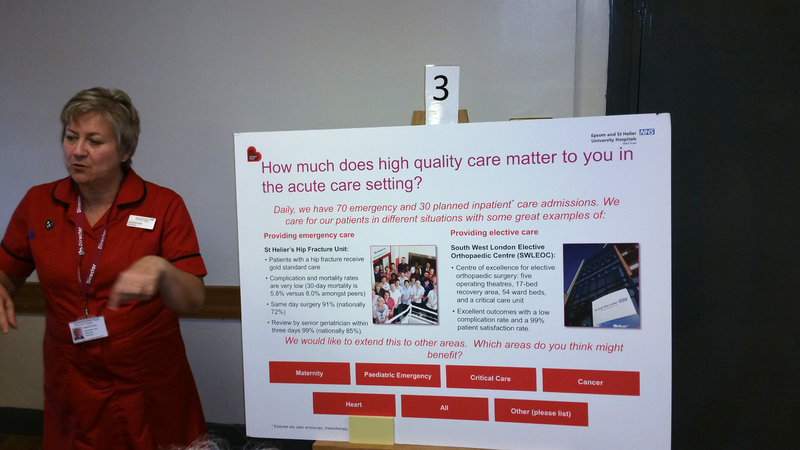 "We'd never make any money"
At one display board, Chief Nurse, Charlotte Hall was present to answer questions, and the discussion turned to maternity provision. Her suggestion was that it would be "better" if the trust provided a "Midwife led unit" at one site, and a full "Consultant led unit" at the other. 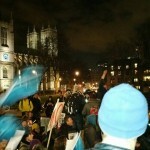 When a KOSHH campaigner pointed out that a childbirth can quickly change from a "normal" one into an emergency, where a consultant led unit is required, and the fact that both Epsom and St Helier currently has a consultant led unit, Ms Hall said "We'd never make any money if we did that". Of course, the response to this was that NHS hospitals should not be about "making money" - they are supposed to be concerned only with providing healthcare. There were very few MPs present at the event. St Helier Hospital stands in Tom Brake MPs constituency of Carshalton and Wallington - he didn't turn up, and neither did neighbouring MP for Sutton and Cheam, Paul Scully, or Wimbledon's Stephen Hammond MP. MP for Mitcham and Morden Siobhain McDonagh did turn up, (nearly an hour late) missing the entire opening presentation, but she did manage to have a private viewing with Daniel Elkeles, while the rest of the audience were taking part in the "Gallery Walk". Unfortunately, she did not ask a single question during the Q&A session. 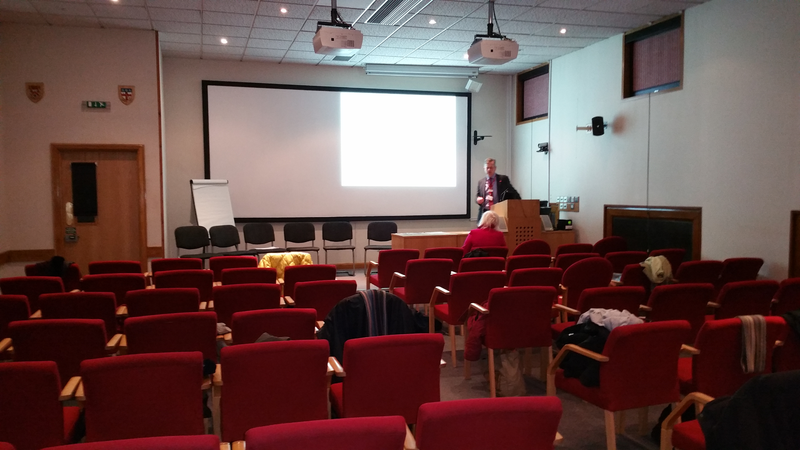 Daniel Elkeles giving a private run-through of his presentation to Siobhain McDonagh MP while the audience had the "Gallery Walk"
During the presentation, a slide was put on the screen to illustrate what the trust board would like to have instead of our current three hospitals. 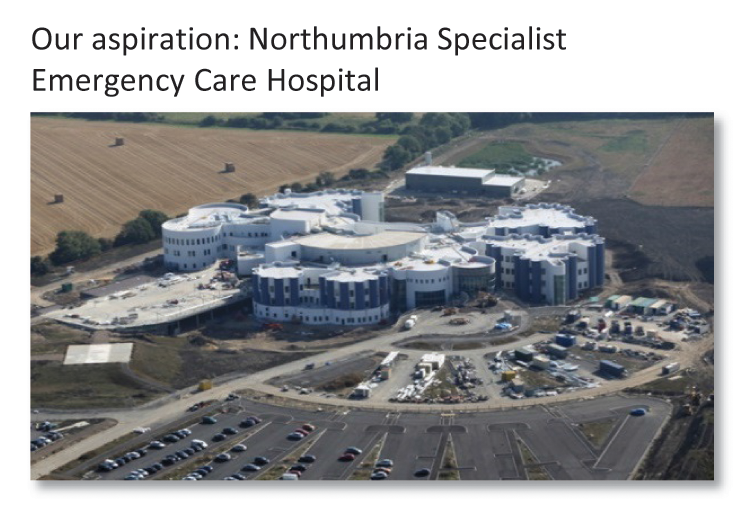 It cited as "Our Aspiration", a hospital called the "Northumbria Specialist Emergency Care Hospital"
Taken from one of the slides used during the presentation. The "Northumbria Specialist Emergency Care hospital" is being suggested as the Trust's "aspiration". KOSHH are very concerned about this, as the hospital in question has been in the news for all the wrong reasons. 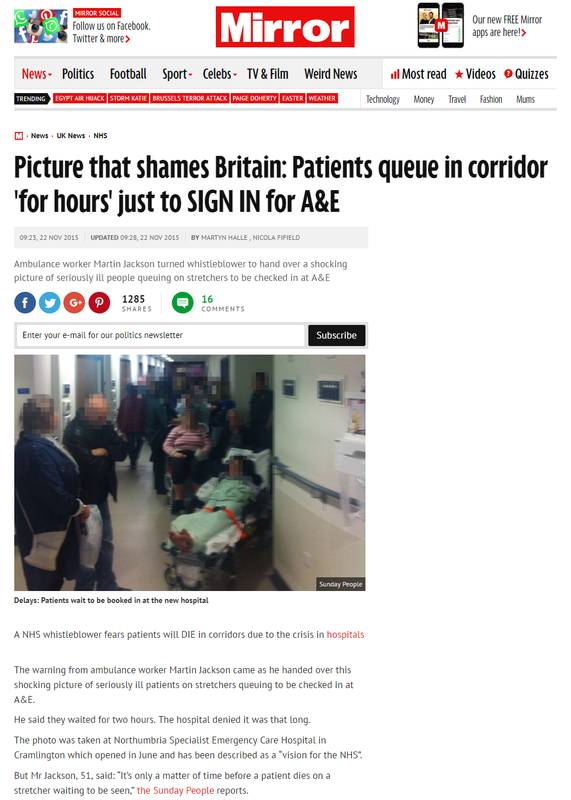 A few months ago, in November 2015, the Daily Mirror ran this story which contained a photograph taken by an "NHS Whistleblower" at the Northumbria Specialist Emergency Care Hospital, showing seriously ill patients queueing on stretchers to be checked into A&E. The Whistleblower said “It’s only a ­matter of time before a patient dies on a stretcher waiting to be seen,”, and went on to say that centralising A&E care for serious illness and injury in such ­“super” hospitals at the expense of other NHS units was not good for patient care. He believed it meant longer travel time for patients and waits for ­ambulance crews. KOSHH is extremely concerned that our local Trust has announced that they "Aspire" to this sort of setup - and that's not to mention the question of how any new building might be funded - a question which Daniel Elkeles again refused to give a clear answer to - instead he suggested that "there is a consensus now that PFI is not the right way of funding hospital buildings". While we would agree that PFI was a very bad idea, it would be reassuring if Mr Elkeles could give some assurances that no PFI scheme (or anything of a similar nature under a different name) would be used at the Epsom & St Helier Trust during his tenure. At the end of the session, KOSHH campaigners spoke with Daniel Elkeles to clarify his earlier comments about how many hospital beds there were within the trust. To our astonishment, Mr Elkeles said that he "didn't know how many beds" they had. Of course, KOSHH does not think that the buildings at Epsom, St Helier and Queen Mary's hospitals are in great condition, but in most cases this is a matter of inadequate maintenance. You wouldn't demolish your house because it needed new windows and a lick of paint.